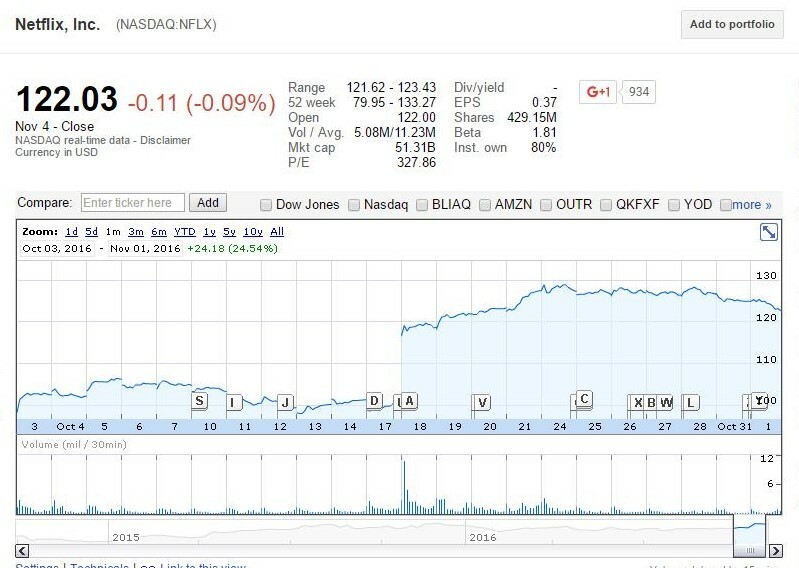 Netflix Inc. (NASDAQ:NFLX) recently reported stellar quarterly numbers alongside robust subscriber growth that propelled the shares from ~$100 to $120 by the next day and ultimately to $130 within a few days (Figure 1). Netflix announced that it brought in 370 thousand net subscribers in the U.S. during Q3 while posting only 160 thousand net subscribers during the previous quarter. Furthermore, its international strength was very robust, adding 3.2 million against a 2.0 million consensus. Netflix’s guidance was higher than most estimates as well coming in 520 thousand and 3.75 million subscribers domestically and internationally, respectively. I’ve written a series of articles highlighting ways to leverage options trading to augment a long position or potentially entering into a position in Netflix. I’ve highlighted ways in which one can layer in covered calls to mitigate risk in a long position as well as utilizing secured puts to enter into a position at a lower price or avoid owning the stock altogether while making money. I’ll discuss my covered call/secured put combination strategy to unlock additional value, mitigate risk and generate income. I’ll break this strategy out into segments to exemplify the power of options when dealing with an intrinsically volatile stock with significant upside potential such as Netflix. In brief, I’ve realized a 13.2% gain relative to a -3.1% loss based on the traditional buy and hold strategy based on the closing price on 11Nov16 of ~$115.